In 1995, my wife Jenny and I bought a house in the countryside, in Devon, a coupe of miles outside the town of Ottery St Mary, near Exeter. This was a former farmhouse, in a poor state of repair, but with a number of advantages outside the simple requirement for somewhere to live. Firstly, for reasons already identified, it was cheap. Secondly, it had outbuildings and, prior to making the purchase, I had applied for (and had been granted) planning permission to operate our then tiny business 'Cameras Underwater' from within the boundary of the attached land. Thirdly, and of relevancve to the second point, it had an indoor swimming pool deep enough for scuba diving; so that it might be used for equipment testing and practice as well as recreation. Like the rest of the house however, the pool was going to need work. 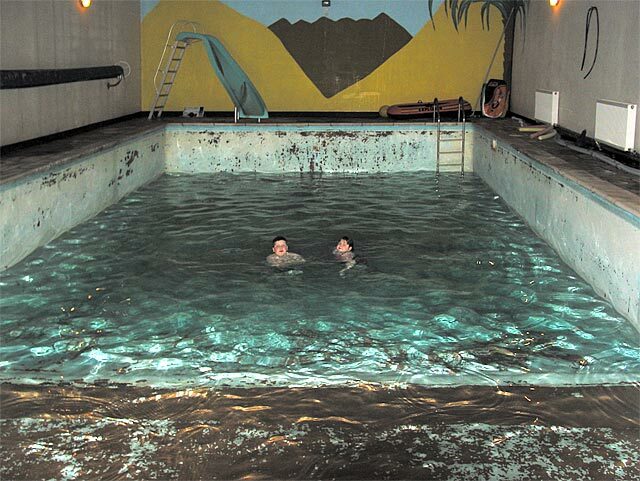 The pool was not in use because the previous owners had not wanted the expense of heating it, and the boiler had in any case failed at some point and had been taken away for scrap. 'Indoors' also meant 'in a walled patio area covered by a corrugated plastic roof'. 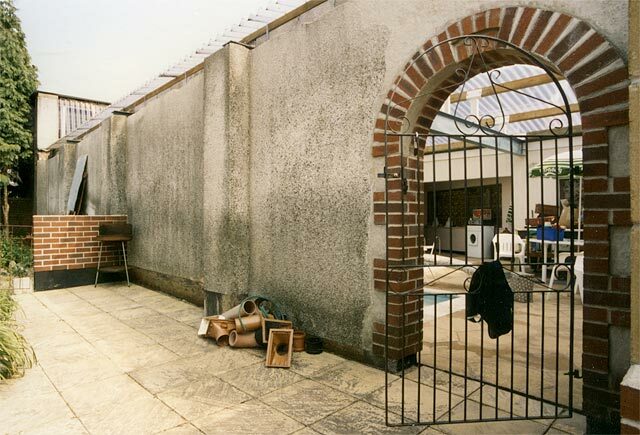 There was no anti-evaporation cover, and air conditioning was provided by a large section of patio wall being made from ventilation blocks (California wall bricks), and the entrance in the opposite wall being a wrought iron gate. This arrangement, and the fact that there was free airflow between the corrugated sheets and the wall plates, might have worked well in Southern Spain, but in England it was going to be cold and draughty. The pool was built in 1975, when the house was still part of the farm. It was constructed from concrete, and was originally made watertight by means of a PVC liner. At some point however, long before we bought the house, the liner had disintegrated and had been torn out and thrown away. The gaps between concrete slabs were then grouted, with a cement bump along the most troublesome join between the shallow-end floor and the slope to the deep end. 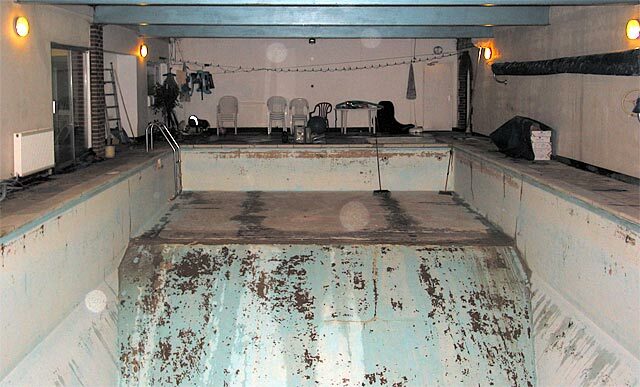 This arrangement was sufficient to reduce the leak rate to a manageable level (at the time), and so the surfaces were painted blue and the pool remained in use. Subsequently, the farmer's children grew up, and the house was sold; there being two more owners prior to our arrival, neither of whom had shown any inclination to upgrade the facility. When we came to view the property however, the pool looked fairly good. We had no way of knowing, of course, but this was because it had recently been given a thick coat of blue paint and refilled, all without any attempt at drying and priming the concrete. This paint flaked off over the next few years, causing a cosmetic disaster and tremendous problems with cleaning and filtration. 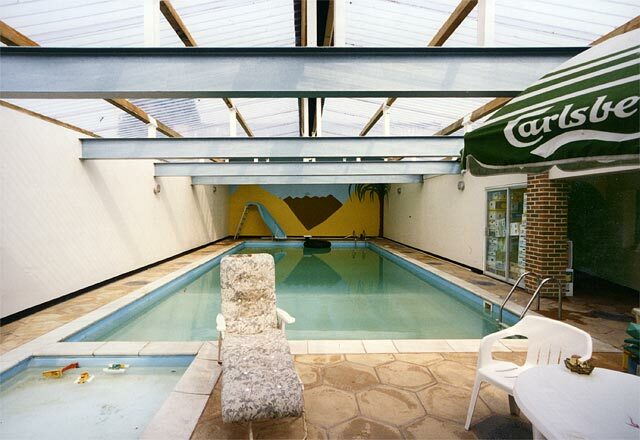 The pool as it was in 1995, with a fresh coat of blue paint, just before we bought the property. The huge RSJs holding up the roof are far larger than needed and were bought by the farmer as a bargain lot. Not shown in this picture: on the left is a gateway in the north wall; and on the right, much of the wall is made from ventilation blocks. The North wall of the pool building, baby pool just visible through the gateway. Wrought iron gates are not noted for their draught exclusion properties. Corrugated polycarbonate sheets rest on the wall plates without any sealing. The modern art installation to the left of the gateway is entitled "I'm arfaid nobody ever got 'round to installing guttering". Some further serious issues that needed to be addressed immediately on acquiring the house related to the water supply and sewage arrangements. Water came from a pair of streams in the woods above the house and was collected in a small reservoir at about 30 metres elevation. This gave a reasonable pressure, but the output was barely enough to supply the house and keep the pool filled, the calculated filling time for an empty pool being somewhere around 6 weeks (125 m3 of water). Furthermore, the pH of the water was 5.5, highly acidic and well outside the potable range; which meant that we also needed to replace a lot of eaten-away copper pipework (and of course, it explained what had happened to the pool boiler). The water was also muddy in appearance, with a subtle fragrance of rotting leaf-mould. We were told that everyone on the hill had similar drinking-water arrangements, and some people lived to a ripe old age. Certainly, the constant bacterial challenge will have contributed to the low incidence of asthma in the local population. At the other end of things, the pool backwash outlet was dumped straight into the main line to the septic tank. Discharging large volumes of chlorinated water into a sewage digester is a seriously bad idea. The water processing arrangements were sufficiently dire that they had to be dealt-with within days of moving into the house. The water supply was fitted with a 5 micron filter, a dolomite column to raise the pH to 7.5, and a UV steriliser. The quantity available was still inadequate of course, but at least we were able to comply with the national potable water standard. The backwash outlet pipe was also routed to the outlet side of the septic tank. The first programme of works for the pool was aimed at making it serviceable all year 'round. A pair of solar covers on rollers was fitted to prevent evaporation loss when the pool was not in use, and a new 67kW oil-fired boiler was installed (there is no piped gas supply on the hill). The pool water was initially heated by passing it through a copper calorifier (hot-water cylinder), at the suggestion of a family member who was a heating engineer. This is not a good method however, because the inlet and outlet pipes are rather narrow, and copper slowly dissolves in chlorinated water unless the pH is fastidiously maintained above 7.6. Hence, after a couple of years, the calorifier was replaced by an A4 (316 alloy) stainless-steel heat exchanger to improve the flow rate. To make the pool hall heatable, the California wall bricks were replaced by double-glazed windows, the back gate was replaced by a double-glazed door, and a double-glazed door was added to close-off the corridor to the changing room and the main house. The heating was provided by 4 large radiators, but the arrangement was not very effective because a tremendous draught could still pass through the eaves of the corrugated roof. Thus, on cold winter days, a thick fog would form within the building when the pool was in use, such that it was impossible to see from one end to the other. Still, the water was warm, the pool was always usable, and the howling draught served to dry the building once the covers were back on. 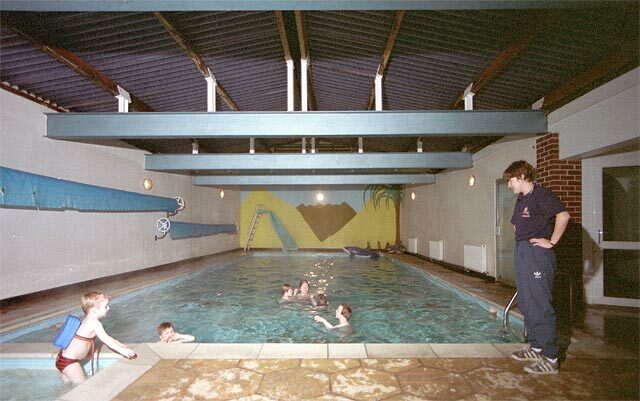 The pool as it was in about 1998. The gateway has been repaced by a double-glazed door. Another double glazed door closes the corridor to the house and the changing room, and the ventilation blocks have been replaced by double-glazed windows. A pair of solar blanket covers can be pulled over the water when the pool is unoccupied. 2003. Steve and Kate enjoying a last swim while the pool is being drained prior to tiling. After 8 years of pool use, the blue paint applied by the previous owner as a sales tactic has flaked off except for a narrow strip above the waterline. The bleached (once blue) paint that remains was probably applied (with suitable primer) shortly after the liner was removed. The shallow-end floor (foreground) is by now almost worn back to bare concrete. 2003. The pool, looking towards the shallow end, fully drained just prior to tiling.